Are you getting enough Omega-3 fatty acids? Salmon is loaded with them. Paired with our tasty garlic asparagus, this delicious meal makes for a satisfying lunch, dinner or post-workout meal (add brown rice if you’d like). Melt in your mouth – delicious! Pre heat oven at 450 degrees. Place aluminum foil on the counter and lightly coat foil with olive oil. Place salmon in the center of foil skin side down. Lightly coat salmon with olive oil then add salt and pepper to taste. Chop garlic and red onions then Place on salmon. 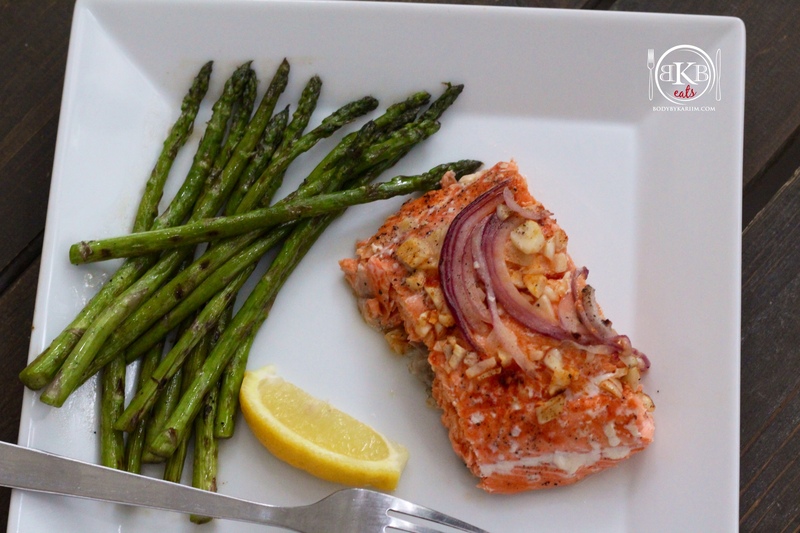 Place salmon on baking pan, place in oven and cook for 12-15 minutes or until fish flakes with fork. 10. Place asparagus on pan and grill 8-10 minutes rolling occasionally until done. Good eats. Light and easy.